Small, smart and perfect for any desk, this branded Smart Calendar - Panorama Easel is just the thing for your next promotional giveaway. The easel-shaped calendar stands up conveniently on any flat surface, and it displays a month to view along with the previous and upcoming month in smaller format below. Your branding is displayed clearly along the bottom, and the left half is taken up with your decoration. 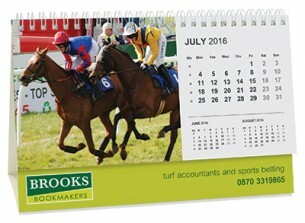 The perfect giveaway for any situation, this calendar is printed using litho or digital printing.